thanks to nosy crow for doing such a great job in getting these lovely doodle titles out in the big wide world! it is sapphires birthday and all she really wants is a pet of her own (not a toad like boris though, maybe a nice sweet fluffy one with less warts). their adventure in this book takes them to see amazing agathas animals at the theatre. with acrobatic guinnea pigs, a magic rabbit and a dancing dog called darren. if you need to know what happens… you will have to get the book and find out for yourself! do you think they have one in brighton? what treasure i recieved in the post just before christmas….. a well loved, thumb eared, deliciously doodled in Magical Mix up book, brimming with fantastic ideas, colour and drawing. The book is now in glorious technicolour which would make any beautiful rainbow feel jealous! What a lovely thing indeed- thank you 7 year old Leni for letting your mum send it to share with me. I love it and think you have done a truely wonderful job… a bit too good in fact- as i think i should retire and you should take over! you have made the book into a real work of art. A big fat well done to you! Here are a few of the pages scanned in for you all to see…. Wowzers…. keep up the good work Leni! i hate drawing things twice- so praise be to working part digitally so you can smarted things up and tweak till everything looks acceptable. 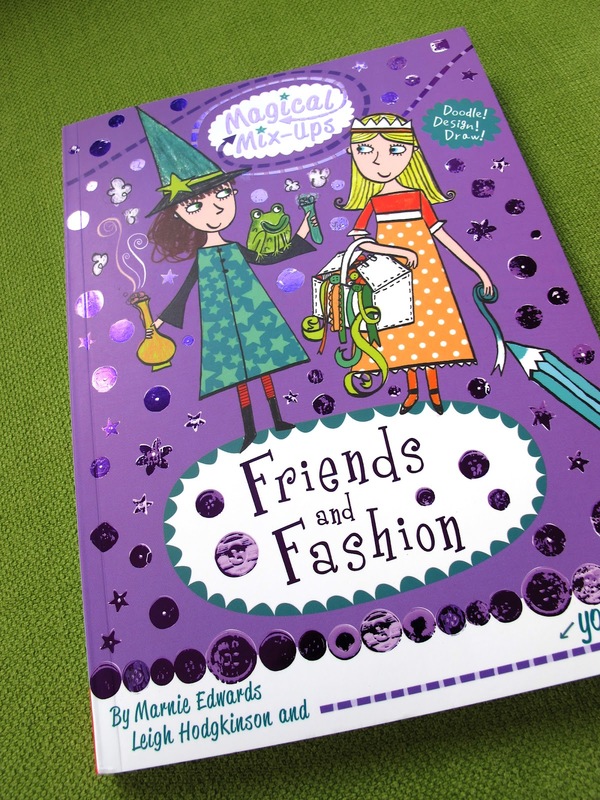 ooh look what i recieved in the post… my advance copies of the next doodle-tastic magical mix up book- friends and fashion. think it will be out in the shopperoonees in sept 2012.
the girls are horrified at some of the outfits at the fashion show. 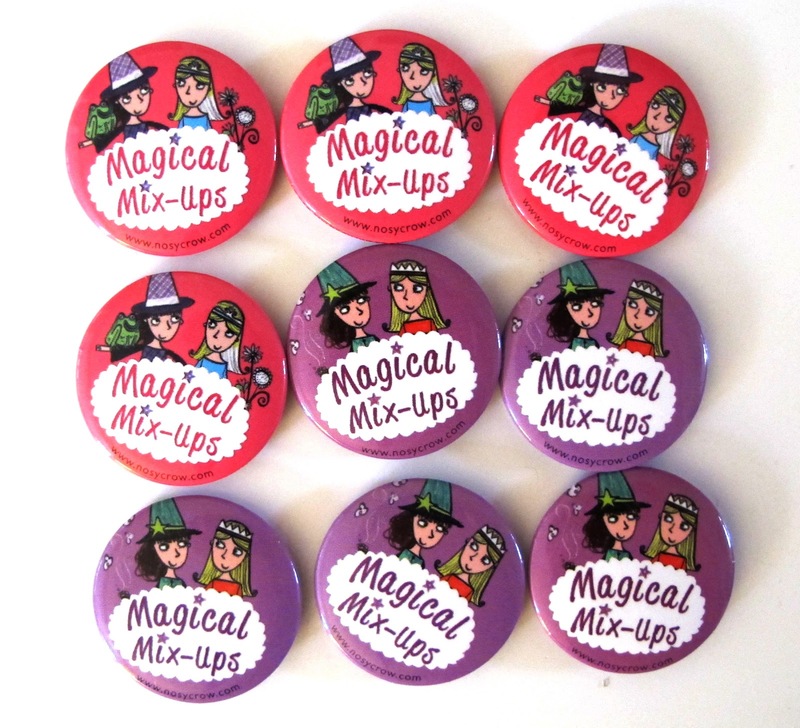 woohoo got a pocket full of mix-up badges through the post today from the lovely Nosy Crows! everyone loves a good badge or two. today i saw the proofs of my second magical mix up books for nosy crow. my advance copies of the first “magical mixup” doodly chapter book with the Nosy Crows arrived in the post today. Think it will be out in marchish? I illustrated the book and it was written by the wonderful Marnie Edwards. It is for ages 7+ and features bonkers besties Emerald the Witch and Princess Sapphire who whizz about unravelling mixups galore. in the book the mixup is a wedding and a birthday party. It is the twin sister book for the uber brilliant “mega mash up” series where the reader is encouraged to doodle and design and finish the illustrations… can think of anything more fun! We are just putting the finishing touches on book number 2… and there are even more to come!